Many graduate nurses say that aged care is not their first choice. It can be difficult to imagine the rewards that come from taking on this responsibility. Yet so many nurses who end up in aged care love what they do and the impact they have. With this in mind, we asked two of our exceptional graduate nurses about their experiences so far. 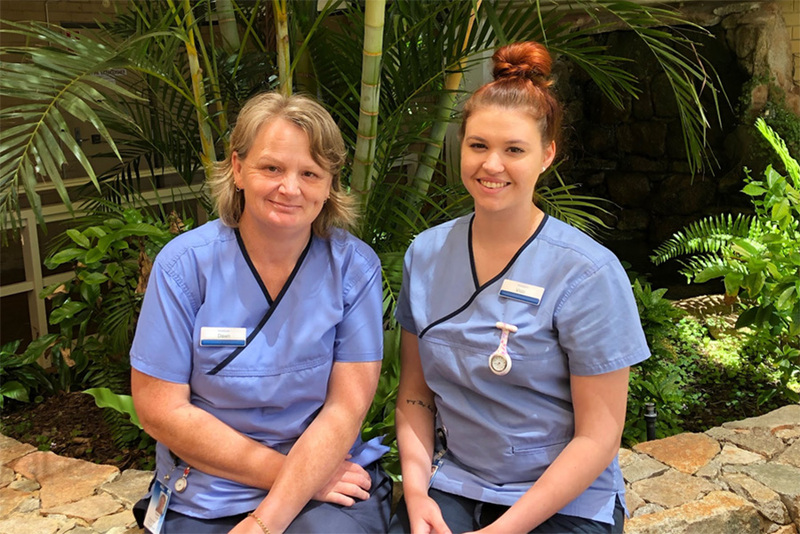 Vicci Millett and Dawn Ogden graduated from the University of Murdoch’s School of Health Professionals in 2017 and were successful applicants to the 12-month Graduate Nurse Program at SwanCare, which finishes in March 2019. Vicci is a friendly, driven 23-year-old, who, like many of her peers, didn’t strongly consider aged care as a career path. However, after running activities for residents in aged care as a student volunteer, she felt very drawn to the sector. Dawn, an experienced nurse who radiates positivity, began her career in community health as a carer in 2007. She felt compelled to help the elderly community and learn more about dementia, after her father’s diagnosis. So what is it like to work in aged care as a graduate nurse? Vicci and Dawn reveal some compelling truths about nursing in this unique sector. Why choose aged care as a graduate nurse? In this sector, nurses are required to step up and take responsibility, working with a team of carers and other support professionals. Nurses in aged care attend to the physical and mental health of residents as their needs evolve and level of dependency changes. “People don’t recognise how diverse our roles can be. It’s very interesting. It’s more than just wound care or distributing medication. We play a key role in the resident’s overall quality of life,” Dawn reflects. Vicci and Dawn say it’s important to research employers (desk-based research and by talking to others in the industry) - particularly in light of the Royal Commission’s investigation into aged care. “We achieved our accreditation at SwanCare not long after the Inquiry was launched. We’re proud SwanCare is known for its exceptional standard of resident care and supportive work environment,” says Vicci. Vicci and Dawn recommend researching graduate programs too. Important questions to consider include: Will you receive a post-graduate accreditation? Will you have a tax-free threshold? How much support will you have? These are all key factors that will impact on your experience and your future career path. There are so many ways you can try your hand at aged care before graduating. Signing up for an agency exposes you to a range of healthcare environments, including aged care. “Volunteering is a fantastic way to see if it’s right for you - it really helped me picture myself in the sector,” Vicci adds. Vicci and Dawn will complete their Graduate Certificate of Clinical Nursing in March 2019, armed with essential health and patient management skills they will carry for the rest of their professional careers. We’re so proud of both of them! Are you a graduate nurse interested in aged care? At SwanCare, we’re passionate about developing health professionals in aged care and community health. We offer a comprehensive 12-month Graduate Nurse program in which graduate nurses work as a part-time RN to enhance clinical skills whilst completing a Graduate Certificate in Clinical Nursing. If you care about older people, why not consider a nursing career in aged care? And if you want to follow in Vicci and Dawn’s footsteps here at SwanCare, please visit our careers page to find out more and apply.